Appling Podiatry, PLLC was established in 2016 by Dr. Robert Appling. We provide a wide range of conservative and surgical services to our patients. We treat both pediatric and adult patients. Dr. Appling is Board Certified by the American Board of Podiatric Medicine. And to our veteran, police, fire, and EMS patients, THANK YOU FOR YOUR SERVICE. Dr. Robert Appling is a native of Southaven, Mississippi. He is the son of Bob and Virgie Appling. He is the son-in-law of John and Rita Stubbs of Ripley, MS. He graduated from Christian Brothers University with a degree in Biology with a Chemistry minor. He then went on to Barry University in Miami Shores, FL to complete his Doctorate of Podiatric Medicine degree. 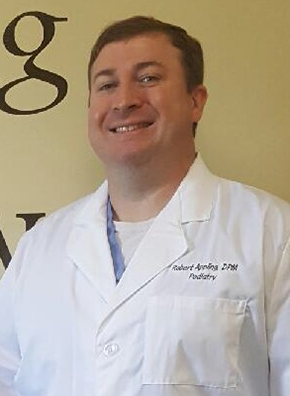 He completed a rigorous three year hospital based residency and trained under some of the finest and world renowned foot and ankle surgeons in Atlanta, GA. Dr. Appling returned home in 2011 to enter into private practice. In 2016, Appling Podiatry, PLLC was founded in order to continue to serve the people of North Mississippi and the Memphis Metro. He and his wife Jenny live in DeSoto County and are raising two beautiful daughters. Both are members of Palmer Baptist Church in Jenny’s hometown of Ripley, MS.